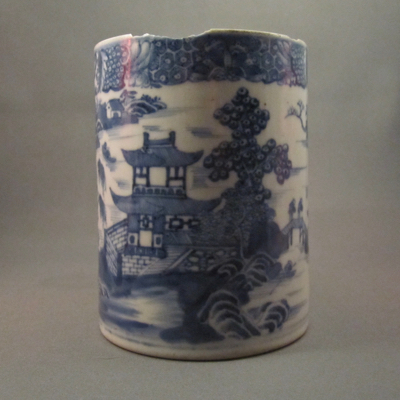 This cylindrical form porcelain mug was made in China during the third quarter of the eighteenth century. 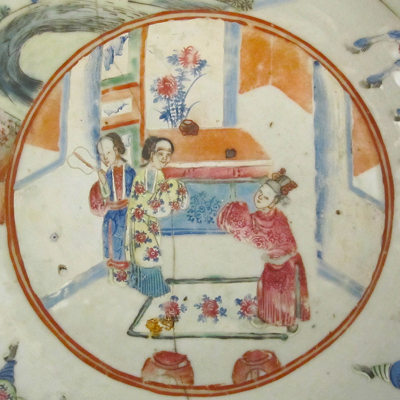 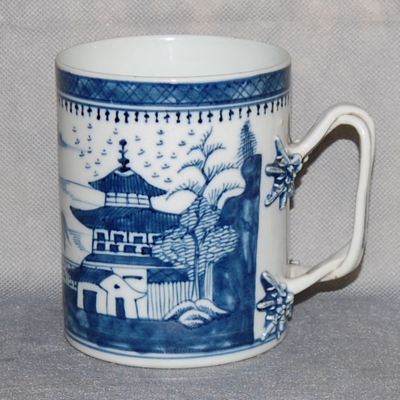 It is decorated in the Nanking pattern with trees, birds, pagodas and boats, using cobalt blue underglaze enamel. 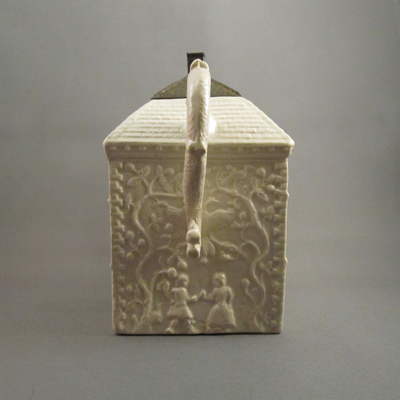 It measures 4.75 inches high with a 3.5 inch opening. 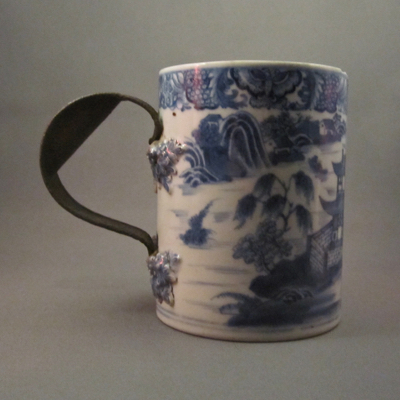 It appears that this mug has a story to tell, as its original strap handle has gone astray and is now fitted with a rusty iron replacement. 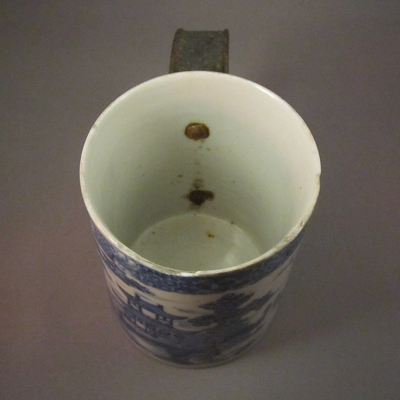 Perhaps a bar room brawl resulted in the loss, or someone dropped the mug while clearing the table, or during a wash-up. 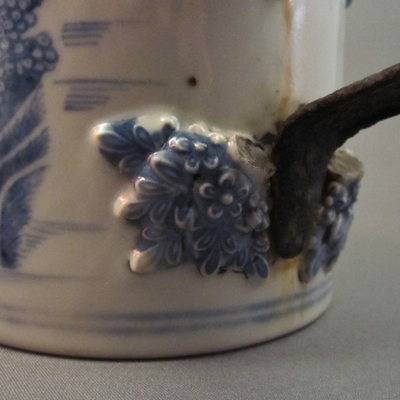 We may never know for sure how the deed was done but I am thankful the owner had the good sense to have a tinker replace the handle, rather than throw out the broken mug. 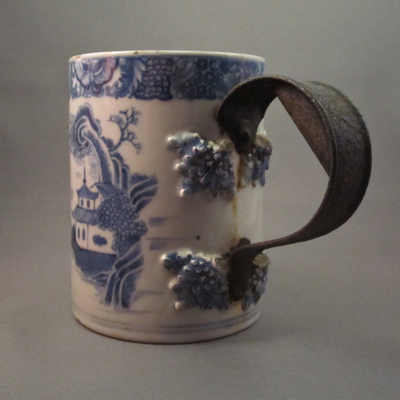 Isn’t it remarkable that this chipped survivor from 250 years ago is still able to engaging us and stir our imaginations? 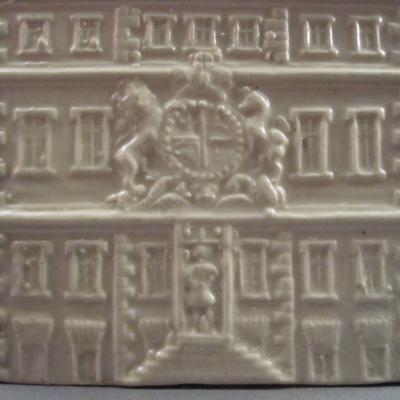 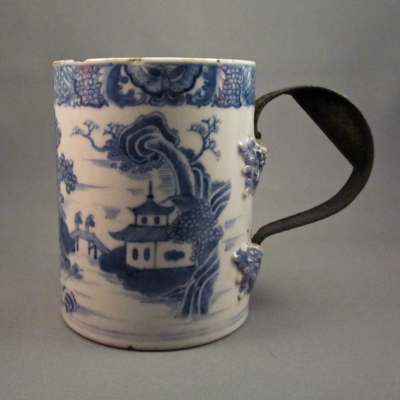 This mug with similar form and decoration shows what the original strap handle might have looked like. 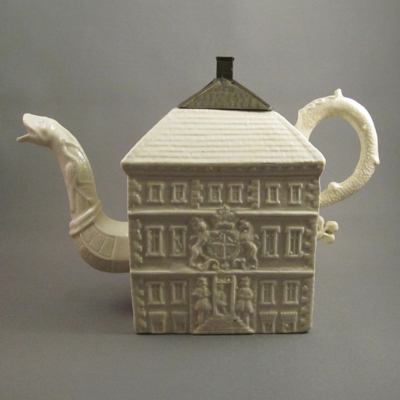 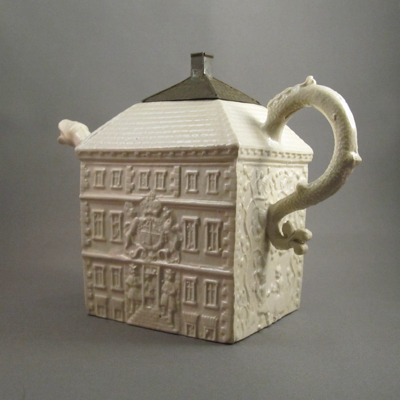 This whimsical teapot in the form of a three-story Georgian mansion is made of saltglaze stoneware pottery. 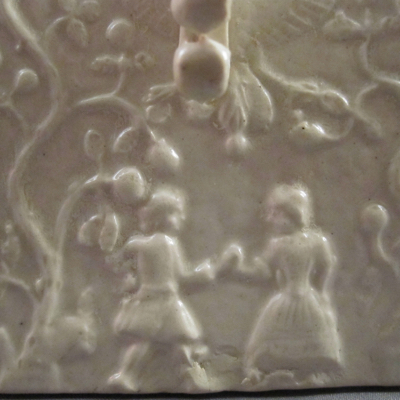 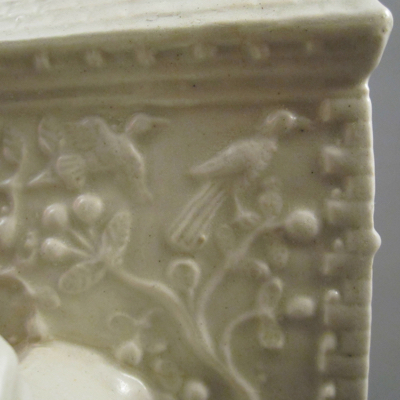 The molded decoration includes a coat of arms, guards, animals, vines, birds, a dancing couple, and a crane on a serpent’s head spout. 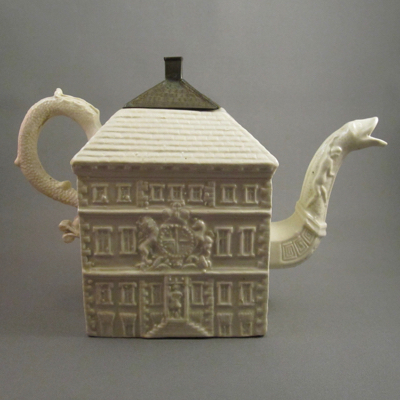 It measures 5.75 inches high, 8 inches wide from handle to spout and was made in the Staffordshire region of England, circa 1750-1760. 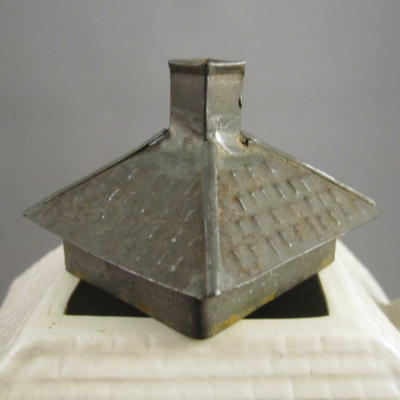 After the original lid broke or went missing, an intricate tin replacement in the form of a shingled roof with a chimney as knob was made by a clever tinker. 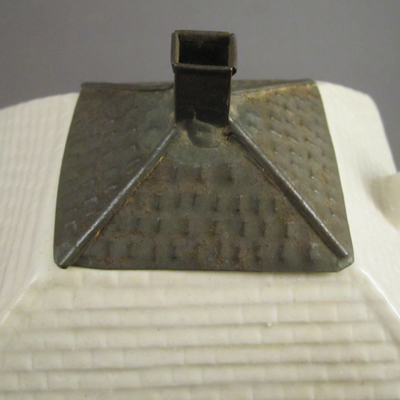 This is one of just a few replacement lids I have come across where the repairer copied the form of the original, and I am so glad that he (or she) did! 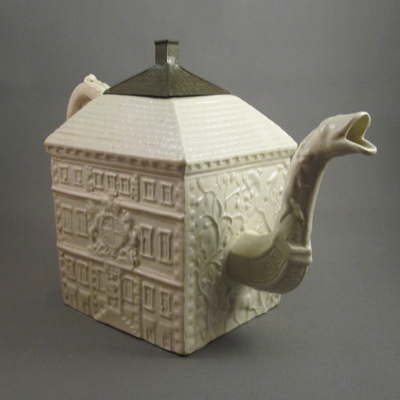 This teapot of similar form suggests what the original lid on mine might have looked like. 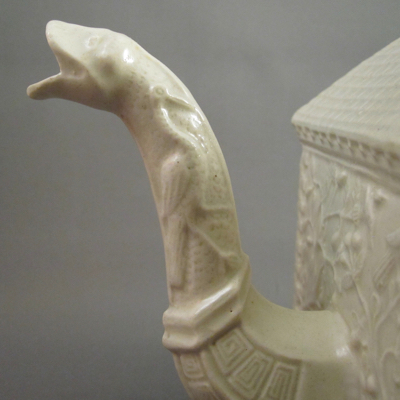 This Dutch shape pearlware pottery jug was made in Sunderland, England, c.1860-1870. 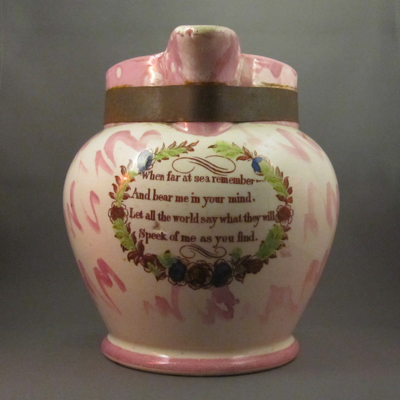 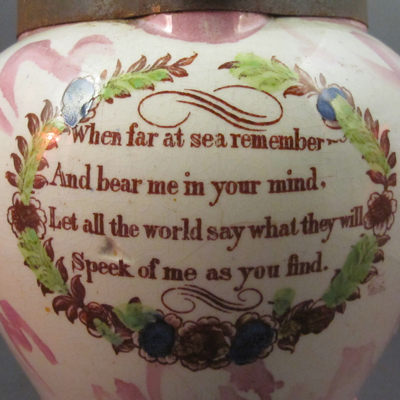 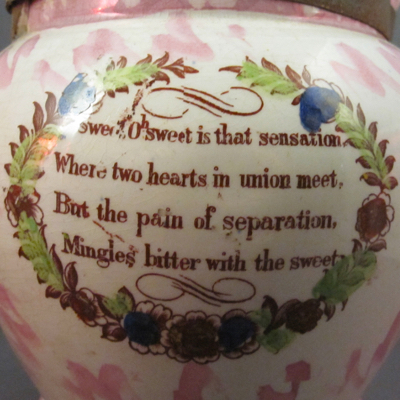 It has dark red transfer decoration of the sailing ship “Great Australia” on one side and verses on the other side and front, accented with washes of pink lustre, yellow, green, and blue. 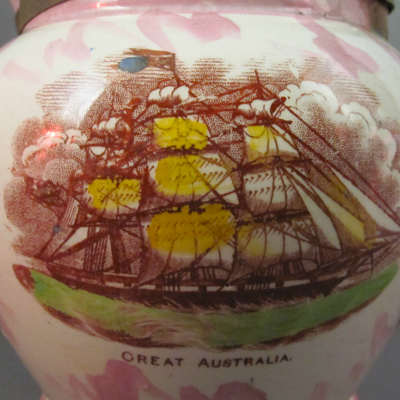 “Great Australia” was built for Messrs Baines & Co. in Liverpool and launched in Decemeber 1860. 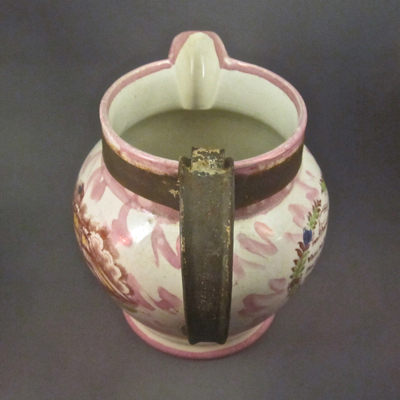 Jug measures 8 inches high and 9.5 inches from handle to spout. 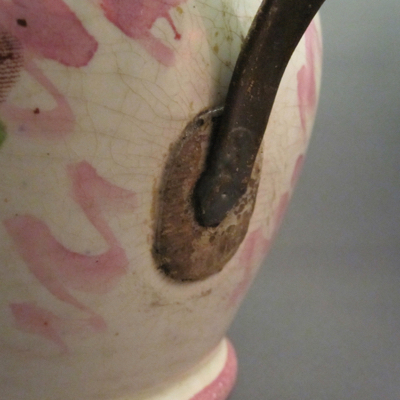 The large metal replacement handle with finger grip, thumb support, and a wide horizontal band were done by a tinker in the 19th century. 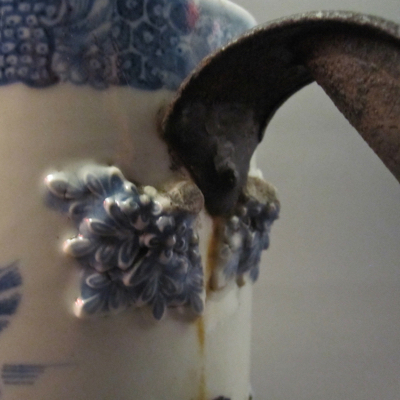 As these jugs were prone to constant wear and tear, it was not uncommon for handles to break off and be replaced. 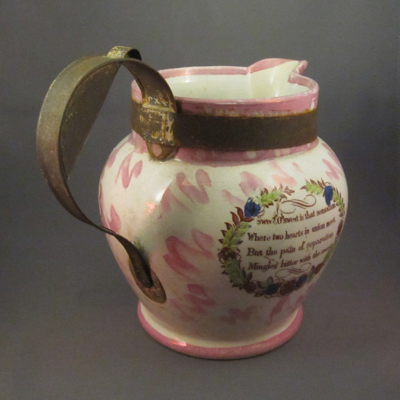 Larger towns and cities had local tinkers but if you lived in a smaller town or village, you would bring your broken household items to itinerant tinkers, who would travel from town to town and set up on the side of the road or in the town square. 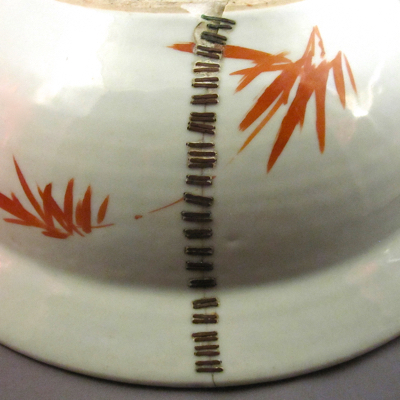 I love finding make-do’s in multiples and was thrilled to find this jug, which is one of a pair. 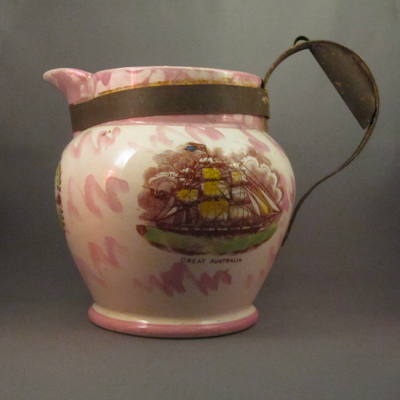 Even better, they match a large jug I purchased many years ago with a similar metal replacement handle, making the set, graduating in size, a trio. 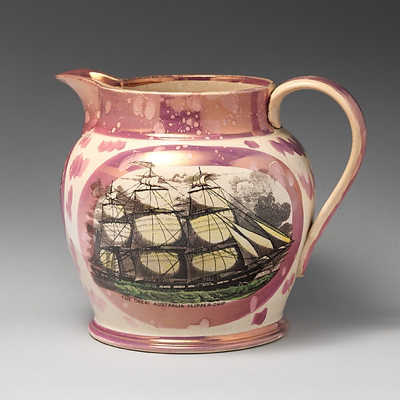 Take a look at Large Sunderland jug, c.1855 the largest jug I previously posted. 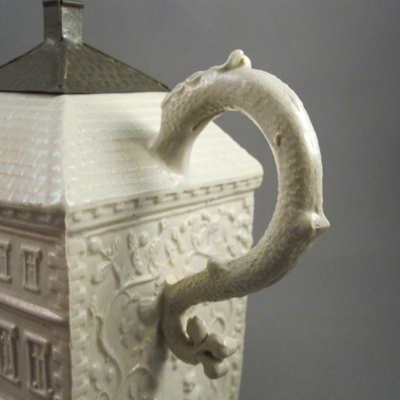 This jug of similar form and decoration shows what the original handle on mine would have looked like. 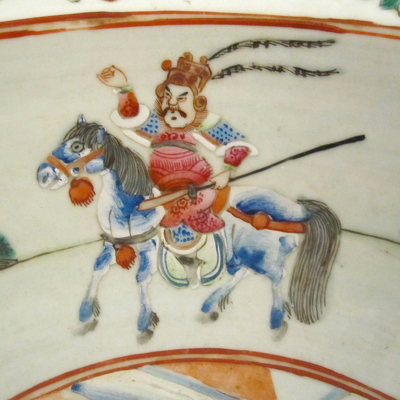 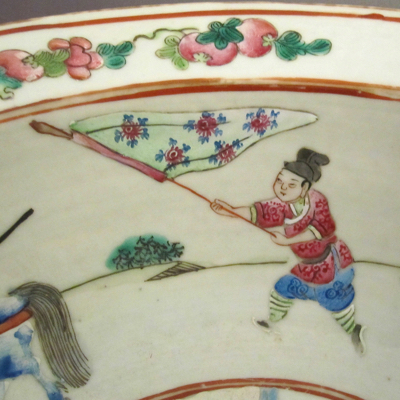 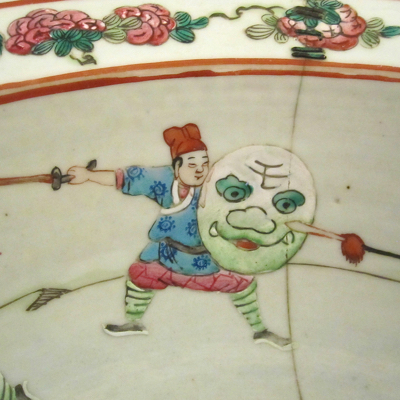 This large porcelain bowl was made in China durning the Tongzhi period (1862–1874). 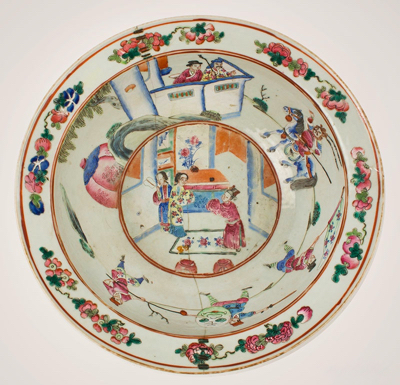 It is decorated with warrior figures, a horse, an interior scene & flowers in the famille rose palette and measures 14.75 inches in diameter and is 4.75 inches high. 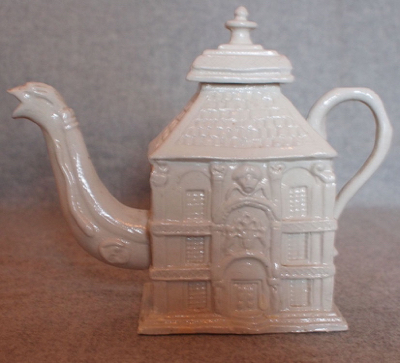 Originally it would have been part of a set which most likely included a matching water jug. 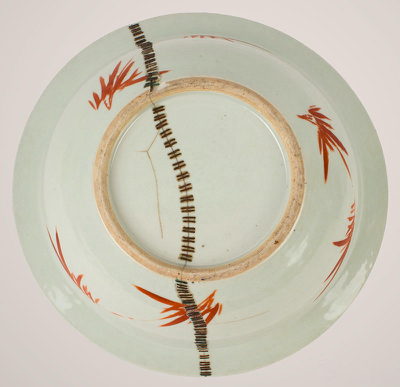 But the true beauty for me lies on the underside. 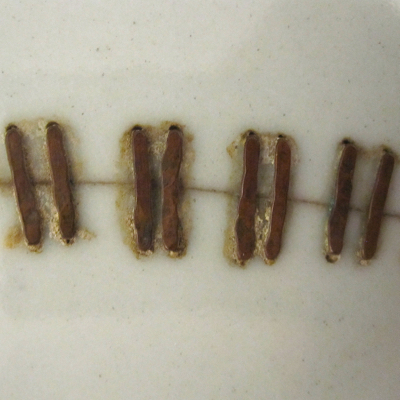 After the bowl broke into 2 pieces, a skilled and patient china mender used 136 metal staples, placed in pairs, to make this broken bowl whole again. 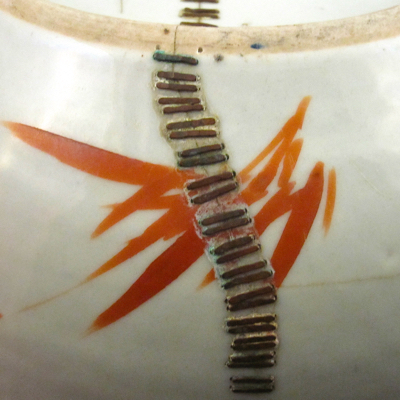 The work is extraordinary and the repair is tight, making it usable. 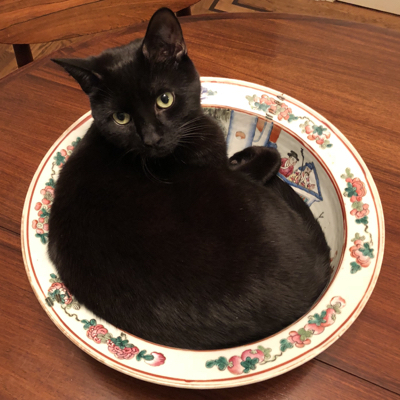 And as you can see in the last photo, Oscar demonstrates that it also makes for a comfortable cat bed.